Shinwa Copper Chasm Katana with Saya, Display Stand - Hand Forged - Copper Blade Finish | BUDK.com - Knives & Swords At The Lowest Prices! When you own a Shinwa, you have a sword that has been meticulously hand forged using ancient, time-honored tempering techniques that give it a custom, one-of-a-kind look and feel. 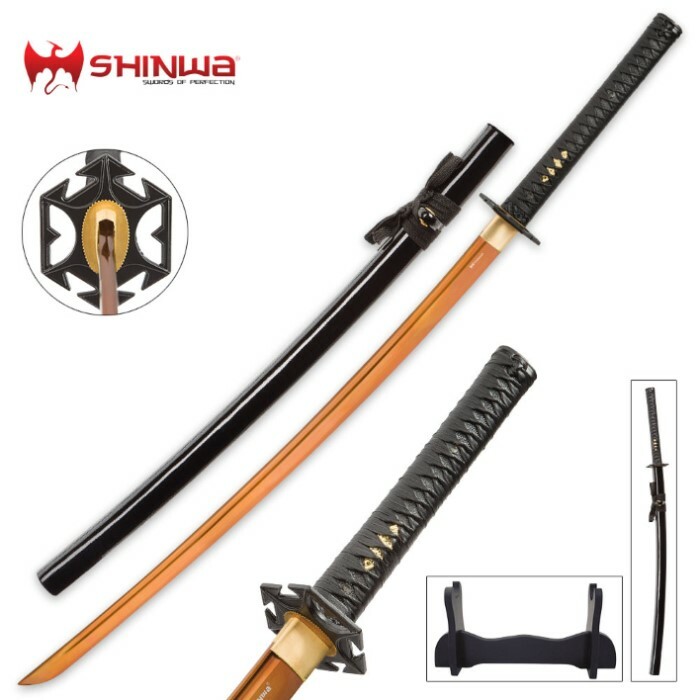 The newest exceptional weapon in the Shinwa family is the "Copper Chasm" Katana, which is visually striking with its contrasting black and copper color scheme. 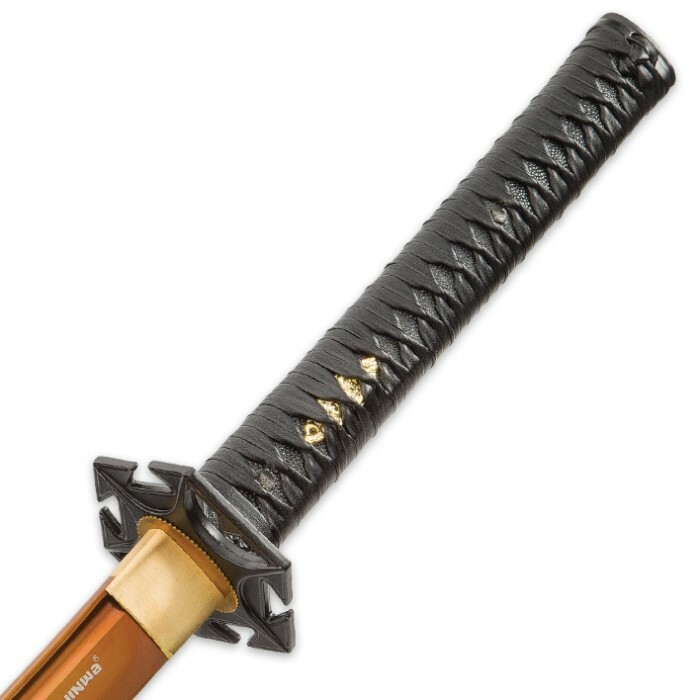 Featuring a full-tang, copper-colored 27 1/2" blade hand-forged from 1060 high carbon steel, the sword has a keen edge and rock solid construction. A black cord and ray skin wrapped handle with gold-toned menuki provides the contrast to the copper blade and brass habaki. The cast tsuba has a geometric design that gives the sword a modern look. 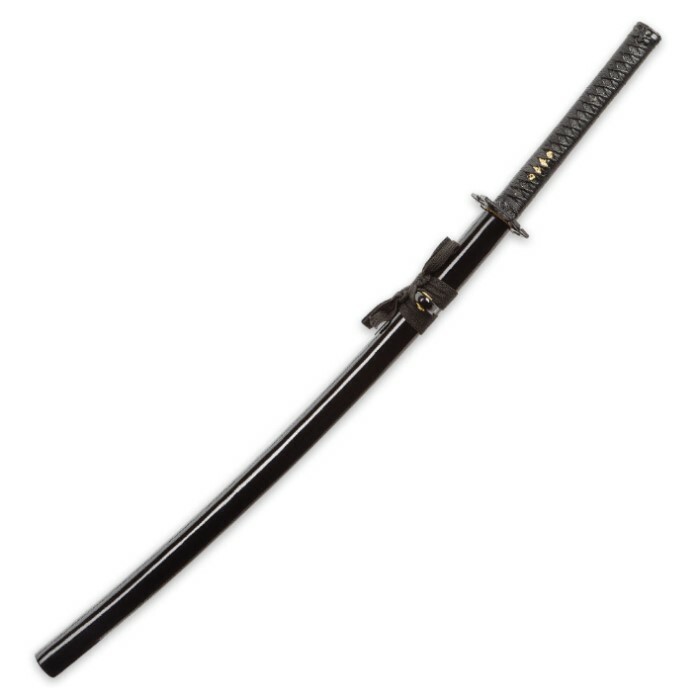 A black lacquered wooden scabbard houses the blade and a wooden display stand is included. Very beautiful Sword! I want to say that my sword handle was wrapped in leather, not in cord as the description states. If you look close enough at the provided pictures, you will notice as I have stated. Mine came fairly sharp and in pristine condition and if i am not mistaken, it is also presented in a display case and also includes a sword bag.